My girls are just a little over one year apart in age (12 months and 18 days, to be exact). As the years have gone by, they have gotten closer and closer together in size. First their shoe sizes aligned, and now they are close enough in clothing sizes that we don't really have any hand-me-downs. By the time Natasha outgrows something, Zoia justbarely fits into it, so we get a few months of wear at most. When it comes to pajamas, there is absolutely no handing down. Natasha suffers from a serious case of eczema and requires liberal amounts of moisturizer on her skin at bedtime. 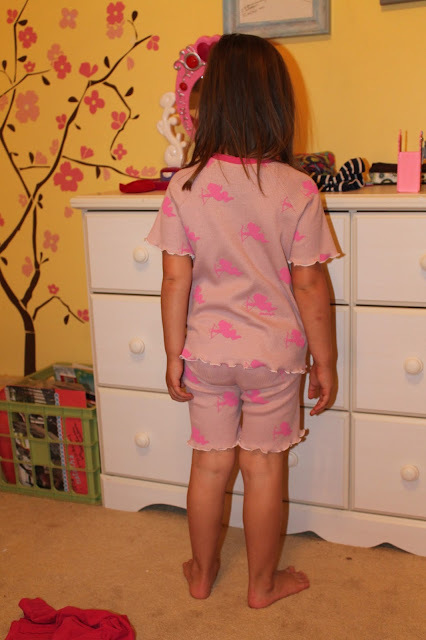 Her pajamas usually give out before she outgrows them just because of the constant laundering to get the oils out. All this is to say that Zoia was in dire need of new sleepwear. Her nightgown from last year still fits well, as do the ones I made the year before, but she wanted some short pjs. I made these using the Oliver+S Field Trip Raglan pattern (size 3T plus length) and the Oliver+S Playtime Leggings pattern. I modified the leggings pattern by shortening it, and drawing the inseam straight down to make some extra room. The cotton thermal knit was acquired dirt cheap from Girl Charlee last year. It was advertised as containing spandex and having "fantastic recovery." Sadly I am not finding that to be the case and am glad I did not attempt to use self-fabric for the neckband as the web site suggested. I really don't think there is any Lycra in there at all. 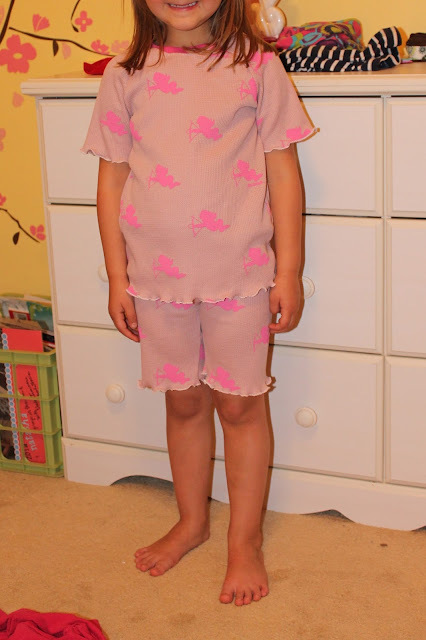 It works fine for the main fabric in the pjs, though. I forewent hemming in favor of a rolled lettuce edge on my serger. The whole set took me about 40 minutes including cutting fabric, and 10 minutes of that was setting up my serger for the rolled edge and then finishing it. And ... done! I have to tell you, I haven't always had the best luck with their stuff either. :/ it's kind of hit or miss. on the bright side, at least it's pjs and maybe doesn't matter as much? The pjs are cute! It's sad when you have 2 girls close in age but don't have hand me downs because they are the same size. I've gone through this with my little girls. Very cute, I've got to learn how to use my rolled lettuce hem on my serger! Hope your husbands recovery is still going well and that you are still getting good support.